The Bishop's Appeal is a stewardship opportunity for each of us to reach out to thousands of people in search of Jesus' love. 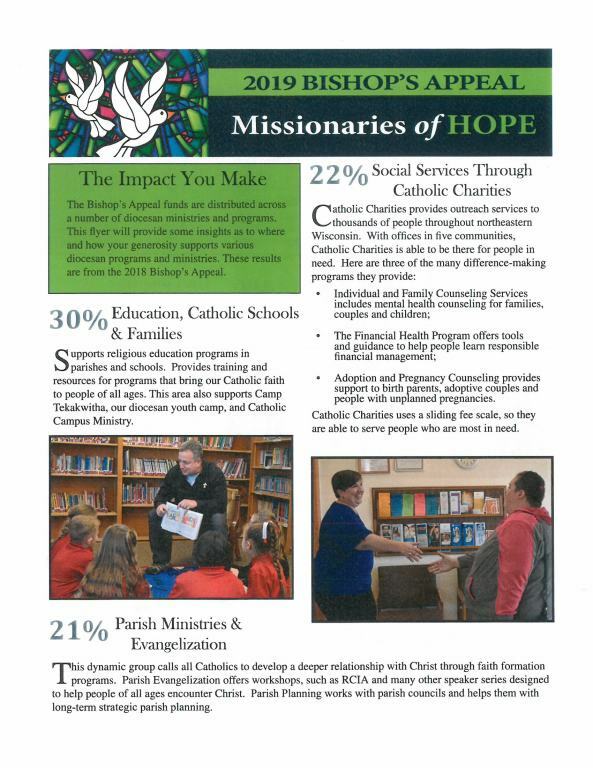 Each gift given supports the ministries of the Diocese of Green Bay which serve our parishes, Catholic schools and communities. Your gift truly helps bring the heart and hands of Christ to our children, young adults, families and neighbors here in northeastern Wisconsin. or call Debbie toll-free at 877-500-3580, ext. 8184. Why Give to the Bishop’s Appeal? Your gift to the Bishop’s Appeal will help in countless ways. Care ministers are trained to go out and share the Gospel with the homebound and sick. Children and families are able to attend lively, interactive education programs learning the Word of God. A young woman in an abusive relationship is able, through counseling with Catholic Charities, to stand on her own feet. Families seeking to adopt are connected with newborn babies. Your gift to the Bishop’s Appeal makes happy endings possible. 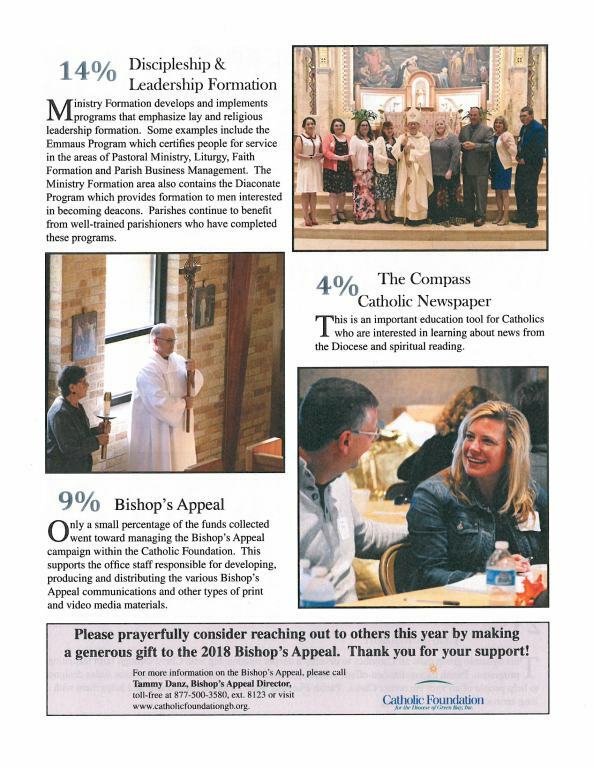 91% of every dollar raised goes to Diocesan ministries and services right here in northeastern Wisconsin. 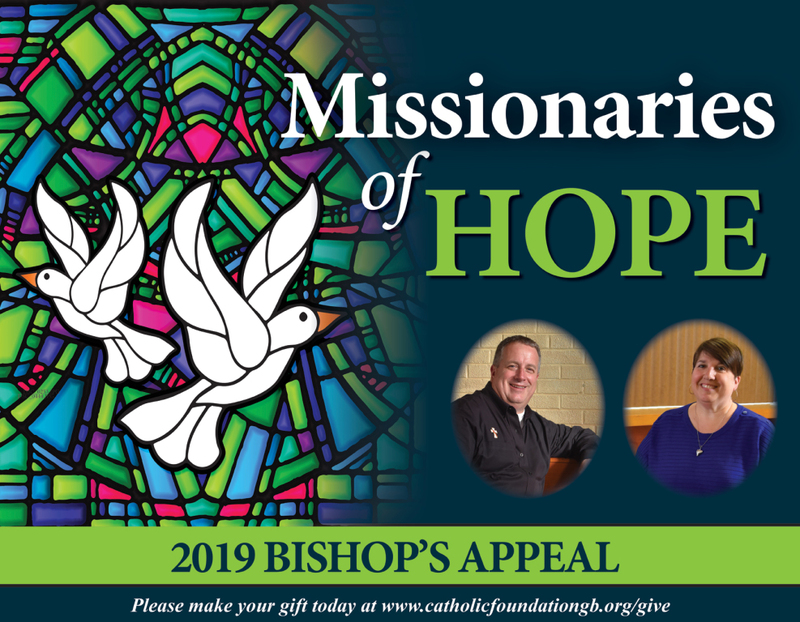 Make a tremendous difference, and give to the Bishop’s Appeal. How much you give is less important than the spirit in which you give. Even small donations add up to large donations. To make a gift today contact your parish, visit the Bishop’s Appeal website at www.catholicfoundationgb.org/give, or call Debbie toll-free at 877-500-3580, ext. 8184.